The UMF Medical 5050 Bariatric Exam Table features unparalleled strength, quality and design. With a patient capacity of 800 lbs. and an heavy duty all steel construction the bariatric exam table will stand up to the rigors of hard and constant use. The 5050 enhances patient comfort with the UMF Medical Ultra Comfort Seamless top with built in pillow. A comfortable experience every time the comfort top is vacuum formed and is easy to clean which prevents cross contamination between patients. The Bariatric Exam Table includes an articulating power back section which elevates to 70 degrees via an electric hand control. Added benefits for the 5050 are an articulating manual leg section for taller patients, a reinforced, slide out non slip footstep, and a concealed paper roll holder. 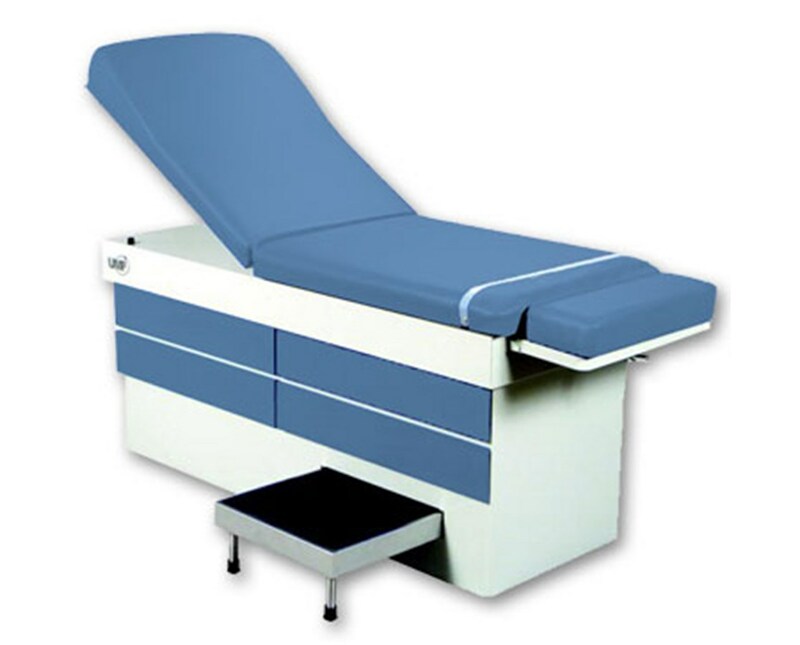 The exam table has four large drawers with ample space. All four drawers operate smoothly on heavy duty, full extension roller bearing drawer glides. 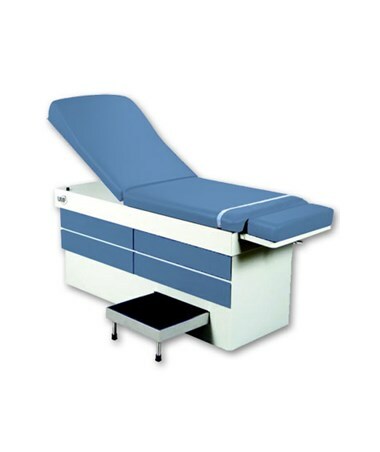 The UMF Bariatric Exam Tables are available in 8 colors. The standard color displayed in the image above is Onyx. You may view the available colors in the color chart and select your preference. Please note your choice of color in the special instructions field during checkout. The Manual ExaminationTable is available with an optional armboard and accessory rails upgrade (specify head section or seat section). Select between two armboards and two accessory rails or one armboard and two accessory rails. Please note these accessories are factory installed. Choose desired upgrade from the drop down menu above and add to cart. The UMF Medical 5050 Bariatric Exam Table has a 800 lb. (226.8kg) patient weight capacity and comes with a 5 year manufacturer’s limited warranty. 800 lb. (362.9 kg) patient weight capacity. Concealed paper roll holder (18” – 21”) (45.7 cm – 53.3cm). Four large, full extension storage drawers on roller bearing drawer guides. Fully articulating 10” (25.4cm) leg section. Reinforced pull-out footstep with non-slip pad. Table Length 70” - 80"